At Rikkers you will always find a wide range of basses, old and new. Come over for an extended test session during our regular opening hours. Looking for an exclusive instrument? You will find old and new basses in almost every price range. We deliver our basses leveled and with a comfortable set-up, with good strings and a good comb. 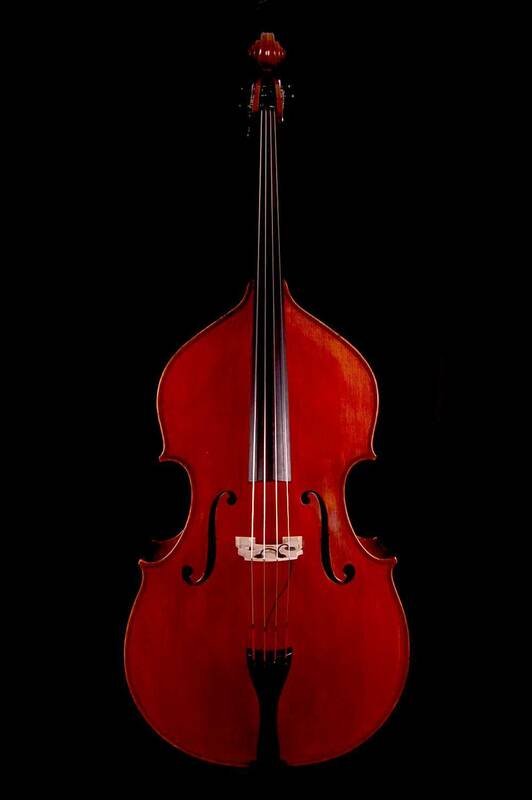 For renting a double bass or leasing a bass and also for professional double bass repairs Rikkers is the right place. Rikkers is the double bass expert in the north of the Netherlands. On thursday- and fridayafternoon we’d love to make time for you. You can also visit us on saturdays but be sure to inform beforehand if Ferdinand Rikkers will be available! Each bass is setup as you desire and is often equipped with our Rikkers double bass pickup. This pickup is made (like many others) from piezo-film but made in a different way and glued to the comb so that a comprehensive and very useful sound is the result. We make our pickups using a special technique where the piezo film is glued to a combination of wood and glue. We make the pickup very hard so it can be bonded to the bridge. This bonding is not forever, it can be removed. The bonding provides the most direct contact between doublebass and pickup. This provides a very strong, powerful and direct sound. Each bass is setup as you desire and we provide them with good combs and strings. We also level the fingerboard and give them a good set-up for optimal playing comfort. Buying a Double Bass at Rikkers is a very customised experience. Curious about all the things we’ll do for your new Double Bass? Check out our video (sorry, Dutch only). Any repair to a double bass has its own merits. If you have broken your bass the best thing is to come and show it to us. Repairwork is so different in nature that we can not give give you a price list, but consultation and advice is free as always with us, so feel free to come along with your problem so we can make you a quotation. Our collection starts with the Chinese laminated double basses. Because of quality differences on the market we often choose them ourselves at our supplier – we are keen on quality. Even the more moderate priced basses come with an ebony fingerboard. We provide them with good combs and strings, level the fingerboard and give them a good set-up. We thereby offer an affordable option for beginners. As a higher quality alternative we can deliver the double bass of Czech manufacture: the basses of Strunal have a full, crisp sound and, thanks to their refined spirit-finish are a feast for the eye. They are made with a solid top, laminated sides and rear, ebony fingerboard and tail and fine hardware. Many players find this a fine jazz bass by the robust lows and full sound. Also, this bass has proven as an excellent base for your conservatory training Light Music to start with and even to complete it. Higher up in the program we offer you the solid wood double basses. We have beautiful handmade basses from Wilfer of South Germany, beautiful Hungarian basses of Laszlo Rac, basses of the Hungarian double bass luthier Balogh and excellent double basses from the Romanian luthier Ducur. We also have many old double basses in the higher price-range. Basses with sometimes a long history and a lot of character. Are you interested in one of these basses you are welcome to try out a few, at us or at your own location. A specialty of our workshop – next to the careful tuning and repairing of double basses – is the Rikkers double bass pickup. This high-end pickup is glued to the comb of the bass, which gives it a particularly powerful sound. Also we supply and fit the elements of quality brands such as Shadow, Highlander and B-Band. Interested in our Double Basses? Want to know more about your specific options? Not sure which segment fits you the best? We’d love to hear from you and help you out!